​Are the whiteboards in your conference room stained and unattractive? Magnetic Glass WhiteBoards, glass art and Signs. day-to-day use. Your glassboard will look as sleek and beautiful in 10 years as it does on day one. (If only the rest of us could age so beautifully…) These glassboards are the perfect fusion of form and function, if we do say so ourselves! Not needing a whiteboard ,but would love a striking piece of art or sign, we have the solution. Glass art will spice up any room, with the vibrant colors that our glass art will produce. Your very own, personal glass whiteboard is now right on your desktop. Got a phone call and need to jot down a number? Have someone in your office and want to draw a picture to explain a concept? This is the answer! Brand it or decorate it any way you want and be front and center. What size would you be interested in? We have a multi-purpose glass substrate product. It can be used as glassboards, glass art, or glass signs. 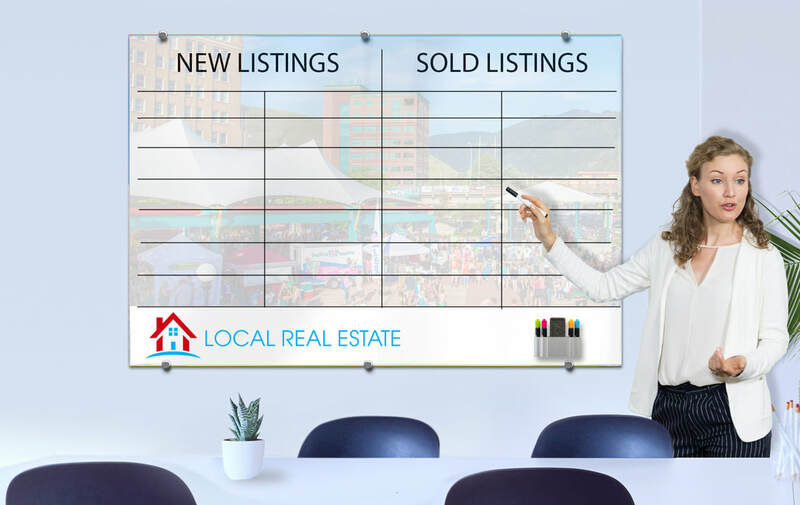 Glassboards are great because they serve as both artwork/signage and as a magnetic whiteboard. Glass art and signs do not include metal backings, but we print directly on the glass so your image will be incredibly vibrant. Glass art can spice up any area, and glass signage can bring your company culture to life! We do the printing for our customers. Additionally, we can work with you to bring your ideas to life, or you can provide us with the artwork you choose. We also have a few accessories available, like a marker holder with super strong rare earth magnets and more. What's so special about glassboards? Glassboards are made of ¼ inch thick, ultra-clear, low-iron, tempered glass. They are affordable, yet high-quality. Competitive products often sell for twice as much as our glassboards with nothing additional to offer. But we do! We offer the ability to customize each glassboard with signage, branding, gorgeous graphics of your choice. You can put up calendars, schedules, sales charts, beautiful imagery, and pretty much anything else you can think of! Why are glassboards better than normal whiteboards? Not only are glassboards a classier-looking option than whiteboards, but they also look nice significantly longer, and don’t leave ghosting from markers. You can even clean them with just about anything! How long do glassboards last? Our glassboards are designed to last a life-time. We have a 100% satisfaction guarantee. If you ever have a problem, we will repair or replace your product for you. Incredibly durable. They are made with tempered glass which insures a long-lasting durable product. The glass is ¼ inch thick and backed up with a magnetic backing which provides additional support. Is it magnetic? What does that mean? We use a high-carbon steel which has been coated to resist rust throughout the lifetime of the glassboard product. The metal is placed behind the glass, so we suggest using rare-earth, neodymium type magnetic accessories to penetrate the thickness of the glass. We offers several accessories which have been designed specifically to work with our glassboards. Can I buy a blank glassboard? How do you clean the glassboards? Glassboards are great because you can clean them with just about anything! In our office, we like to use window cleaner and a microfiber cloth. But you can even clean them with water and a paper towel! Alcohol also works great. How do I install my glassboard? 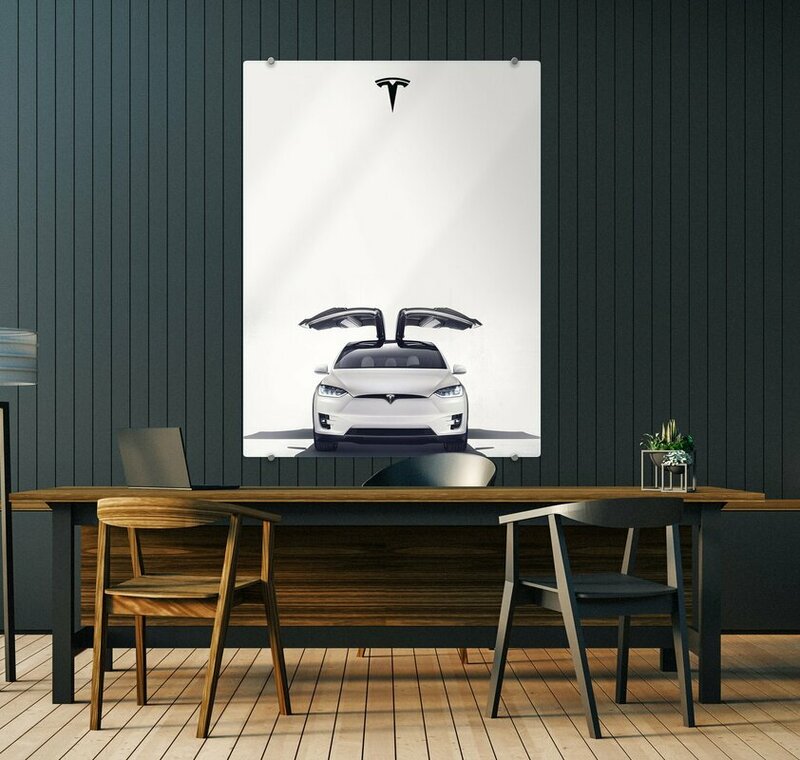 Each glassboard comes with an easy-to-use mounting template. What kind of surface can you install on? They can be installed on any type of wall, but we only provide the installation hardware to install them on a dry wall. I have my own stand-offs, can I use them? Yes, but they must be edge-mount type stand-offs. Note: you cannot drill holes in the glass since it’s tempered and would shatter with any drilling. Can you really print on glass? Absolutely! It enhances the vibrancy and overall eye-catching quality of the image. We have two options. Either you can create the artwork and send it to us or we can design it for you! 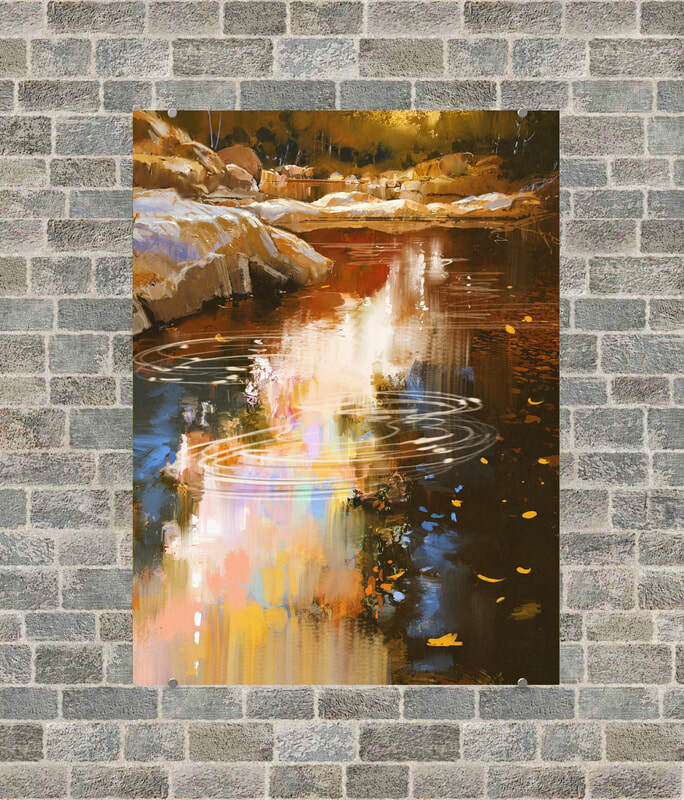 If you create the artwork, make sure the original image is at least 200 ppi at full size and that it’s the dimensions of your chosen glassboard plus a quarter -inch bleed on every side. We can email you a template as well. What kind of images can I put on my glassboard? From your favorite hobby to your favorite place, you can print virtually anything! We often purchase and use stock images that we find. Just make sure the image is a minimum of 200 ppi at full size. What's the best type of image? This totally depends on what you want! Some people choose to use our boards as artwork, rather than a dry-erase board. In that situation, you just want a clear image of whatever you want, that is as intricate or as simple as you want! If you are hoping to use it as a dry-erase board as well, we suggest finding images that are a little more simplistic with large areas where you can write. Some people even put a few boards up next to each other and put images on the ends and leave the middle boards white. Whatever works best for you! At least 200 ppi at full size. When you create the artwork, make sure it’s the dimensions of the selected glassboard plus a quarter-inch bleed on every side. Is it difficult to write on? Since it’s glass, it is easy to write on! However, dependent on the artwork selected, some boards are harder to see the writing than on others. We have found that there are many marker options that can be read on darker backgrounds, in addition to the usual markers that work well on lighter backgrounds. You can even use permanent markers – it comes off with a little bit of alcohol. What types of markers work on them? You can use any type of dry-erase markers, including chalk-based dry-erase markers. You can find neon colors of these that show up well on darker boards. You can even use car window markers and permanent markers – it comes off with a little bit of alcohol. Can I drill holes into the glass? No. The glass is tempered and would shatter if drilled into. Why can't I just go to a local glass manufacturer? Our glass is specifically manufactured to be lightweight, to have rounded edges, to be tempered, and to be as inexpensive as possible. We also use a crystal clear glass that doesn’t have the green tint that you’d likely get from a local glass manufacturer. Why glass and not acrylic? Simply put, glassboards look classier than acrylic boards and acrylic is prone to abrasion, while our glassboards are much more resilient. Our glassboards will look new and beautiful for many years to come! Absolutely! It enhances the vibrance and overall eye-catching quality of the image. Can I buy just the metal? Would the glass fall, break, and hurt someone? We put our glassboards up with the same mounting clips used for hanging mirrors, so they won’t be going anywhere. Even if it did fall, the glass is tempered and would shatter into tiny pieces that could be swept or vacuumed rather than into large, dangerous shards of glass like normal glass would. How difficult is it to ship? We have designed ship-safe packaging and have had relatively no problems with shipping. If you should ever have a problem, let us know, we’ll take care of it! Please allow 5-7 days for production after artwork approval. For rush orders, email info@kdesignmarketing.com for more information.